GROUP A REVIEW: Veszprém look to be in trouble, after losing their third game in a row, against previously winless Kristianstad. Brest lost their fifth consecutive game, 35:26, against Kielce. 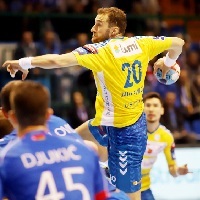 It looks like there is nothing Brest could do right now to stop their losing streak, as the Belarussian side lost their fifth game in a row in the VELUX EHF Champions League, this time against Kielce, 35:26. The Polish side took the lead after a goal from Luka Cindric and never looked back, as Brest never looked strong or lucky enough to claw back and earn at least a point. Meanwhile a draw against Montpellier last week was just the beginning for Kristianstad, who earned their first win of the season against Veszprém, 32:29. The Hungarian side recorded their third consecutive loss, tying their worst losing run ever in the competition. Consistency was the problem for Kielce this season in the VELUX EHF Champions League, yet the Polish side managed some brilliant games, earning four wins before their away tie against Brest. And there was no problem this time for the Polish side, which produced their best game of the season, leading from the first minute until the end to frustrate Brest once again. "It was complicated," said Kielce coach Talant Dujshebaev, adding his team needed "an excellent performance" to get the win. "Most importantly, we tried and fought all 60 minutes long. We all kept in mind that we lost here in Brest last season." Two goals from veteran Mariusz Jurkiewicz and two goals from Alex Dujshebaev helped Kielce jump to an early 6:3 lead. There was little that Brest could do, but a 4:1 outburst underlined their ambition, as the 9:8 lead was the only one for the Belarussian side in the whole game. It was an outstanding team performance for Kielce that helped them take back into the lead, with all the outfield players who checked into the game scoring at least one goal. The 15:13 lead at half-time was followed by a quick 8:1 run, spurred by Blaz Janc and Alex Dujshebaev, Kielce’s best scorers on Saturday. It was a hole that Brest could not get out of, as the Belarussian side lost their fifth game in a row – their third at home – while Kielce earned their biggest win of the season, 35:26. "We played a really bad match tonight," Brest caoch Manolo Cadenas said. "The team from Kielce outperformed us in all the components of the game - defense, attack, transition from defense into attack. Undoubtedly it is going to be challenging moving further in tournament. But we will keep fighting." The two teams will met once again next Saturday, in Kielce. Winning the group was certainly out of the question after an up-and-down start for Veszprem, but the Hungarian side still had everything to play for to improve their position. Therefore, winning against Kristianstad was mandatory. Judging by the start of the game, Veszprém clearly understood it, jumping to a 7:3 lead with goals from every position. A total of nine Kristianstad players added to the scoresheet in the first half, but the Swedish champions only managed to cut the gap to one goal at half-time. The result came despite Veszprém’s shot efficiency which was considerably better than Kristianstad’s. Yet handball is full of surprises and this was another one. The Swedish side tied the game for the first time in the 36th minute, then took their first lead 10 minutes later. Coach Ola Lindgren said he had decided to "run more" and the strategy paid off. "I'm very proud of how the team played in the second half," he said. Centre back Marc Cañellas added: "We got rid of the technical errors, a thing we haven’t been able to do previously in the Champions League." There was no coming back for Veszprém, whose galaxy of stars looked stupefied and had no answer for backs Stig Tore Nilsen and Olafur Gudmundsson. They scored goal after goal, as Roland Mikler and Arpad Sterbik failed to stop their shots. The 32:29 win was the first victory of the season for Kristianstad, ending a record nine-game winless streak over the last two seasons for the Swedish side. The two sides will meet again in Veszprém next week. Veszprém coach David Davis said the team would go back to the drawing board and prepare for the rematch.